Mallorca is the largest of the balearic islands but you will still not be more than 40Km form the sea at any time and most of the island, including Palma will have a maritime climate. 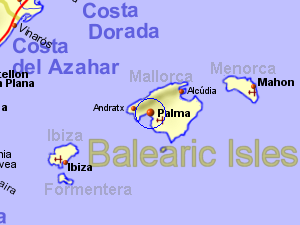 While Palma weather station is only 4m above sea level, immediately inland from the north west coast is a range of mountains rising to 1000m. In these mountains, temperatures will be cooler, particularly when the sun is not shining, and the rainfall will be higher. The average rainfall for Palma is 461mm or 18.2 inches (Source: World Climate), with very little rain falling in July and August but the wettest month being October.